If you’ve ever felt that something horrible would happen if you didn’t hold your breath inside a tunnel, be advised that a teen in Oregon just proved the opposite is true. 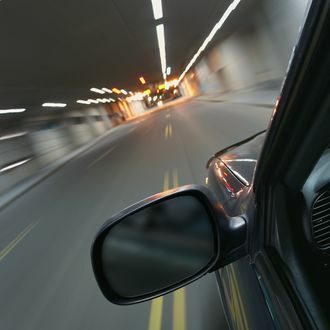 Police say Daniel Calhon, 19, admitted to causing a three-car crash in a tunnel northwest of Portland on Sunday afternoon when he tried to hold his breath and fainted behind the wheel. Four people, including Calhon and his 19-year-old passenger, suffered non-threatening injuries when his 1990 Toyota Camry crossed the centerline and collided head-on with a 2013 Ford Explorer. The two cars then smashed into the interior tunnel walls and a 1999 GMC pickup. Calhon was charged with reckless driving, three counts of reckless endangerment, and fourth degree assault. Hopefully, this story will be passed around among the youth of America at least as much as the stupid superstition that sparked it.